GPS Glass Plastic film is a critical component during construction. 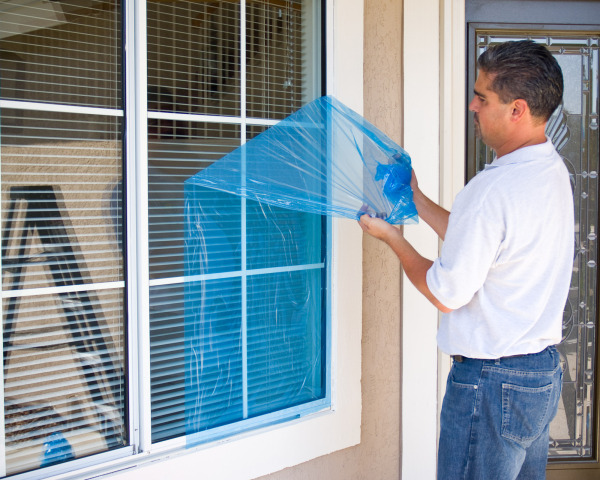 It sticks to the glass to protect from paint, wet stucco and other debris from marring the glass. GPS offers 2 different glass/window protection films, in both blue and clear versions. The GPS Glass Plastic 6 Months is excellent for use on projects up to 6 months long. GPS Glass Plastic 1 Year is perfect for jobs lasting up to one year. Both are 3 mil films with water-based adhesive systems. Both have been in the market for many many years, and offer an excellent level of protection at excellent prices. The 1 year GPS Glass Plastic self adhesive film, when compared to traditional PVC 1 year films, is quite a bargain! The number one reason self-adhesive plastic/ glass film is so great for use on windows is that it stays on the window, and nobody has any reason to remove it. Traditional means of protection, where plastic is taped over the outside of the entire window and frame is almost never left undamaged, and the windows most often suffer damage of some kind. Longlasting window protection at excellent prices. If the windows are operational, they can be opened and closed for interior ventilation, without damaging the protection. Glass Plastic Questions? Contact us below.